Hi everyone. 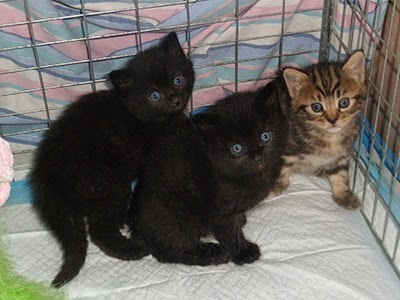 In my last blog post we were off to collect Honey (white and tortie coloured) and her four kittens Harissa (female, tabby) Hazelnut (female, black) Halloumi (male, black) and Herbie (male, black) and here they all are, settled in their pen in our dining room. Just like last year when my mum was fostering, we are now eating our meals on trays in the lounge. Cats Protection has given me a lot of the supplies needed to look after Honey and her kittens including; weighing scales, special animal-safe cage disinfectant, cat litter, dry and wet food, cloths, disposable gloves, bowls and special food in case they get an upset stomach. We supply the washing powder, bin bags and kitchen paper. I have quickly settled into a routine. Under my mum’s supervision I clean out the pen completely each morning, wiping everything down with disinfectant and put in clean bedding, a clean litter tray and water. I then feed Honey her wet food. Luckily I have never needed much sleep so I’m up at 6am whether I have school or not. However before fostering you could find me slumped on the sofa in my PJs staring at the TV until the last possible moment before school. Not anymore! As soon as Honey hears me fumbling for my cereal bowl in the kitchen she begins to call. She is a very friendly and affectionate cat and loves human company. We have been told she is four years old but looks and acts much younger. Mum then takes over while I am at school including serving Honey her dry food. I am not home long after school before I have to serve Honey her wet evening meal. Later in the evening I give the pen a good tidy up and clean the litter tray before putting in fresh water and dry food. Every evening I also make sure I handle the kittens and spend some time with Honey. Mum goes to bed at about 11pm so she has a last look in for me before the whole thing starts again in the morning. Every day, Cats Protection paperwork must be filled in for Honey and her kittens, detailing drinking and eating, weeing and pooing, (who knew poo consistency could be graded 1-6?! ), behaviour and general comments. There is also a weighing sheet and socialisation sheets showing what the kittens should be exposed to at certain ages. The first week or so the kittens (aged two weeks) were very sleepy and unstable on their feet. Their eyes had just opened. Honey spent her time feeding the kittens, eating and dozing. I made sure I kept the room quite quiet and peaceful but Honey was still exposed to normal noises like the radio and vacuum cleaner and seemed very relaxed about it all. Week two was a challenge – it was kitten worming week as they were three weeks old! Last year my elder sister was brilliant at giving our foster kittens their worming paste. She is at university this year so mum and I had to attempt it between us. We obviously don’t have the same knack as my sister, as on the first night, mum got more down her jumper than in the kittens! Veterinary note: It’s important that during the ‘socialisation period’ kittens are gently exposed to a variety of positive experiences – different sights, sounds, textures and smells – in order to understand what is normal and safe. Give an FIV cat a chance!